Tan colored fairly fine texture. 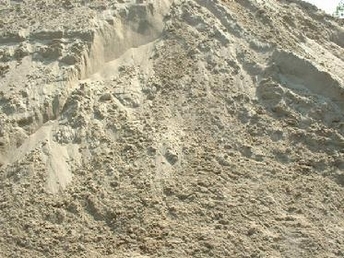 It is a washed sand, and contains no pebbles. Also called pool sand or play sand. 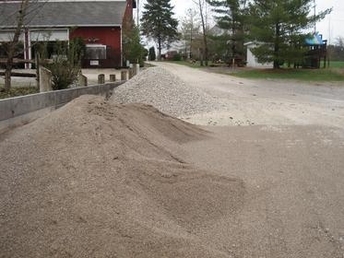 Can be used for mixing concrete or mortar, golf course sand traps, sandbox or play areas. Under pool liners or for under paving stones or bricks. 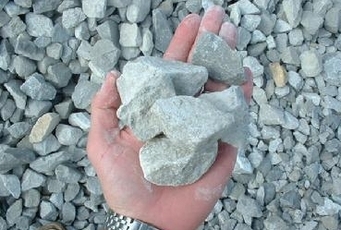 Gray solid stone comes from the natural sources and is crushed to different sizes. 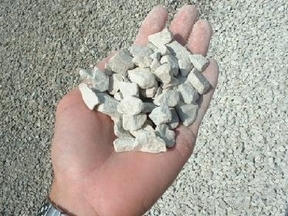 The most popular choice stone for our area driveways & parking lots. Many people mistakenly refer to limestone as slag, but really mean limestone. Remember the smaller the stone the smoother the finish will be. The softer the area you are working in the larger the stone you should start with, then add additional layers of smaller stone to desired look. #10- screenings, #8- pea size, #57- 1", #4- 3", #411- 1" to dust, #304- 3" to dust. Washed dark brown to gray sand. Coarse in texture with small pebbles in it. Can be used for mixing into soil to break up clay, mixing concrete, backfilling underground utility work, etc. White colored "beach sand" very fine texture, very clean sand. Good for mixing in stucco, golf course sand traps, sand boxes, play areas, under pool liners, for decorating, etc. A natural blend of dirt, clay & sand that is not processed. Used primarily for fill, can be fairly clumpy. No organic matter so it compacts well, good for backfilling holes or trenches, or for areas that processed soils are too expensive for, then adding a top coating of soil. This is a rough fill for use in large holes. It consists of whatever is dug out of the ground naturally. Our fill dirt is clean but consists of sticks, rocks, clay & roots. It is hardly workable by hand & can be very clumpy. Must be top dressed to plant anything in. Good for filling in old basements, swimming pools, or rough grading work. Suggest a machine for moving it!! Approximately 70% topsoil, 20% organic compost & humus, 10% coarse sand. Great all-purpose soil. Easily worked by hand and suitable for most applications. Great for planting trees, putting in new lawns or patching bare spots. Finish grading, making raised beds or filling low spots. Product is used to grow mushrooms one season, all organic sterilized, superior soil conditioner. Made up of a variety of manures (sheep, chicken, cow, etc. ), and peat moss. Has all the nutrients and low ph needed for any type of planting. Strong odor when delivered, but dissipates soon after material is spread. Plants exceed most expectations when soil is enriched with this product. 100% pure organic hardwood bark. Mostly oak, cherry & maple. Has been shredded at least 2 times. Is a very dark brown, similar to coffee grounds or chocolate, in color. Great for moisture retention & adding nutrients to soil. Excellent for week control & decoration around trees, shrubs & beds. Hardwood mulch that has been color treated with FDA approved dye. This product is NOT recycled wood material. Shredded at least 2 times, for a very fine texture. Excellent for weed control & decoration around trees, shrubs & beds. Available in Brick red, Black and Brown. 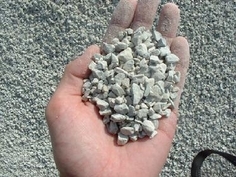 Also known as silica gravel. Manila or ivory colored only available in size #67(1/2 to 3/4") smooth & round not bright white. Purely a decorative stone for around flowerbeds, pools, walkways, etc. Premium split seasoned firewood. All our wood is 100% clean and Ash Borer safe hardwoods including ash, hickory and cherry. 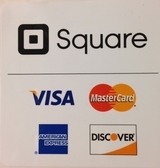 Stacking is available for an additional charge. Wood is sold in increments below.